This is one naughty list you won’t mind being on. 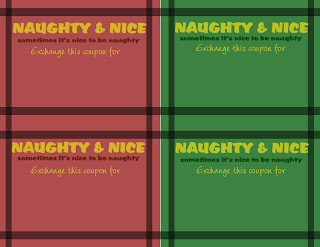 This week’s printable is a naughty or nice coupon template. I’m not sure about the rest of you, but we’re still pinching pennies over here so Christmas is going to consist of a whole lot of homemade. I’ve made a couple of personalized signs (in case you missed those they are here and here, the second one would make a really cute teacher gift. I’m just saying.) I’ve made a Church ABC’s Picture Book for Little Monkey. I made two terra cotta gumball machine candy jars. I’ve made Display Blocks. And those are pretty much the gifts we have given so far… minus the ABC book… that’s a stocking stuffer, but he’s one and can’t read so I’m not so worried about him finding out about it. So, while I am spilling the beans that My Mr Right is getting a coupon book, that’s probably no less than he expected. Here’s the template. Click the image, then right click the image, then save it to your computer. You can open it up in Photoshop or even Paint and fill in your love coupons. I have 52 ready-made love coupons. One for each week of the year. I plan to offer to let him use one on our date nights each week… Easy date night spicer upper (yes, I just said spicer upper) and we actually use the gift. You can purchase the 52 Ready-to-Print love coupons from my Etsy shop for $15. I worked for hours (literally hours) on these… Feel free to take advantage of my cheap labor. They are four to a sheet, 13 sheets and will need to be printed, cut apart and then put together however you would like to present them. Oh, as part of the 52, there are 12 Naughty and Nice (a little more risque), so if you don’t want to use those, you’ll need to make 12 more love coupons for a whole year’s worth. I printed mine on card stock with my Canon printer. I’m hoping to laminate them, we’ll see, and then just tie them purdy with a ribbon and insert into stocking. Ta-DA! Enjoy. Happy Holidays! What a sweet idea! Thank you for sharing it! Those are cute. Thanks for sharing over at Tuesday Tell All.